Grand Colony Island Villas is an exclusive beachfront all villa luxury resort on the tropical island of Ambergris Caye (San Pedro), Belize. Grand Colony features luxury two and three bedroom Villas. 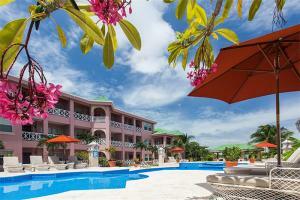 The pool is located in the center of the resort with ocean views and a fabulous beach only 25 feet away. Fashion your own luxurious home away from home in true island style.